The Mystery of Woolley Mountain (PC) REVIEW - Wool You Believe It? The Mystery of Woolley Mountain (PC) REVIEW – Wool You Believe It? Woolley Mountain is a touching homage to 80s and 90s gaming, but modern audiences may struggle to get along with it. I feel like I’ve said this four thousand times, but people love nostalgia. I do too, so I’m always up for a long delayed sequel, reimagining, remake, or even a spiritual successor. There’s also those games that pay homage to a type, genre or era of gaming. The Mystery of Woolley Mountain is no different. The Mystery of Woolley Mountain is two things: it’s a love letter to the British home computer era, while also being an ode to 80s and 90s Lucasarts adventure games. The game hit its Kickstarter goal back in 2016, gaining £9,579 worth of funding. It certainly helped that legendary point and click game designer Ron Gilbert was one of Woolley Mountain’s backers. Two and a half years later and The Mystery of Woolley Mountain is here. I don’t feel like I need to explain point and click games, but you point and then you click. Items, objects, people or scenery can be interacted with, picked up or spoken to. The storyline revolves around rescuing acclaimed explorer, Vandamme Laudenkleer, who has been captured by an evil witch who lives in the titular Woolley Mountain. Laudenkleer was captured during a solo mission to rescue a group of children who too are held captive at Woolley Mountain. It’s up to his group of travelling scientists, The Helmholtz Resonators to rescue him. Woolley Mountain crams many of its early scenes full of interactable, retro items. Record players, ZX Spectrums, retro posters and even a copy of Crash magazine. Most things are interactable in the early submarine section, but often I found it all a bit distracting. I can jump on the drum kit and play for a few seconds, but if I misclick and hit the drum set I have to watch the animation each time, that can be a bit annoying. Also, early on in the game you’ll come across a colour mixing puzzle, during which the player character tells us that the solution is around somewhere. This led to me searching around the sub repeatedly looking for the solution, but it turns out that this solution isn’t solved for some time into the first act and an awful lot of other unrelated things have to be solved first. This is not unusual for this type of game but the set up suggested the solution was nearby so I kept trying. 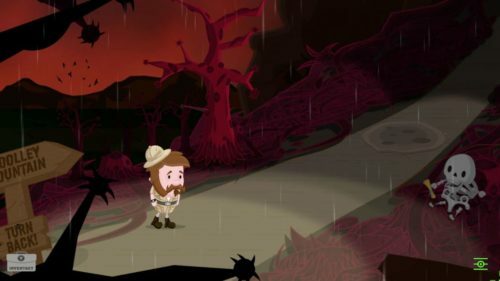 The Mystery of Woolley Mountain attempts to be a faithful adaptation of a 90s style adventure game, and to its credit, manages to hit the nail on the head in terms of gameplay and presentation, but the game design seems to be stuck in the era too. There’s little direction or aim in terms of what is meant to be done next, which can lead to wandering around the same few screens searching for clues. Sometimes you’ll find yourself doing the good ol’ pixel searching to locate items that you may have missed. While it does extend the length of the game, it’s these design elements that modern point and click games try and steer clear of. Some people will love the fact that it keeps close to the classic style games, but for me it grew a little annoying. The graphics aren’t the most impressive you’ll see, even for an indie title. They’ve got a basic 2D, South Park-esque quality to them, while not amazing they’re perfectly serviceable. Everything is very well drawn, and a lot of work has gone into them. Each scene is filled with things to examine and explore, and there are plenty of easter eggs. But personally, I didn’t like them. The sound effects are fairly basic, and while the game is fully voiced, it feels as though the whole cast is voiced by only a handful of cast members. The soundtrack is easily the best thing about this game. They’ve managed to make a soundtrack that is inspired by pre-NES gaming, but also manages to be modern and fun. That makes up most of my thoughts in Woolley Mountain, it isn’t perfect, but it has a great sense of fun. Woolley Mountain is a British game, and that British humour seeps out of its every pore — it positively reeks of it and that’s fantastic. It’s also a very easy game to pick up and play: there isn’t much exposition, and while I’d have liked some more in depth character interaction, the game mechanics are very simple, it’s a case of clicking around and the plot doesn’t really take up much time at all. The Mystery of Woolley Mountain is a touching homage to those point and click games of the past. It’s filled with references and it’s obvious that the game’s designers have a lot of love for 90s adventures as well as early home computer titles. Woolley Mountain is overflowing with jokes, references and easter eggs which all relate to these eras, and it’s wonderful that it celebrates them in such a loving way. That being said, I think people coming to the genre for the first time might find Woolley Mountain a confusing and illogical experience. Woolley Mountain does admittedly give you all you need to get through its puzzles. They’re not overly hard either, but it’s more about not knowing when to do the puzzles or in what order, players can easily find themselves doing puzzles that they can’t actually complete until later. The Mystery of Woolley Mountain is a good game, but it’ll appeal to a very particular type of player, and anyone new to this genre may struggle. Ex-wrestler turned promoter. Videotronic game player and general media connoisseur.